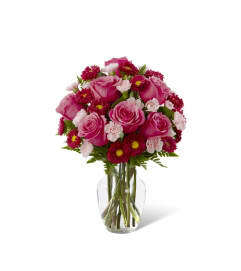 A combination of blushing hues and sunlit warmth, this spring bouquet blossoms with love and gratitude to make the season brighter with each hand-picked flower! 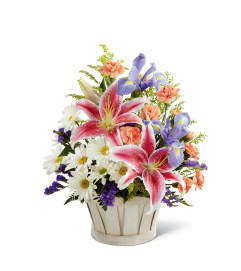 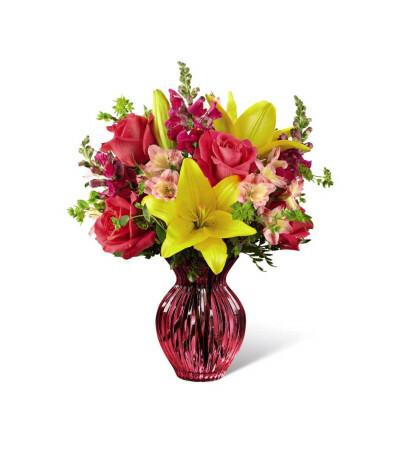 Hot pink roses and brilliant yellow Asiatic Lilies will capture your recipient's every attention, surrounded by pink and yellow Peruvian Lilies, fuchsia snapdragons, bupleurum and lush greens. Presented in a keepsake berry pink glass vase to give this design a head-to-toe finishing touch, this gorgeous flower arrangement is set to create the perfect Mother's Day, birthday, or thank you gift.